that's too bad!!! i would feel naked without my wedding ring! Hey. Give it time. I had to wear my ring on a necklace from the time I was about 5 months pregnant until about 4 weeks after I had Sydney. Give it a little more time. Your ring is gorgeous by the way! Suprisingly I understand since Amy is going through the same thing. She hates not wearing it and it's been many months now. 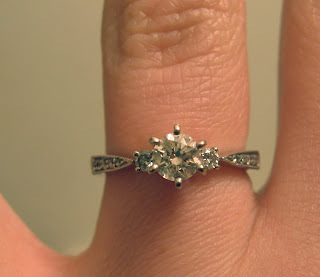 You can always just get it resized if you want.